A few years ago, I felt like every other word being thrown around in food world was “umami“. From food critics, to journals, burger spots and heck—even soy sauce commercials. And it made me wonder, how the heck did we used to describe foods of similar taste profiles before? Now, I highly doubt you’ll ever catch me using this phrase to describe foods, mostly because I don’t want to sound like a poser. But that’s not to say, I don’t love ingredients that are supposed to epitomize “umami“…..like mushrooms. Because y’all know, I am a mushroom fanatic. 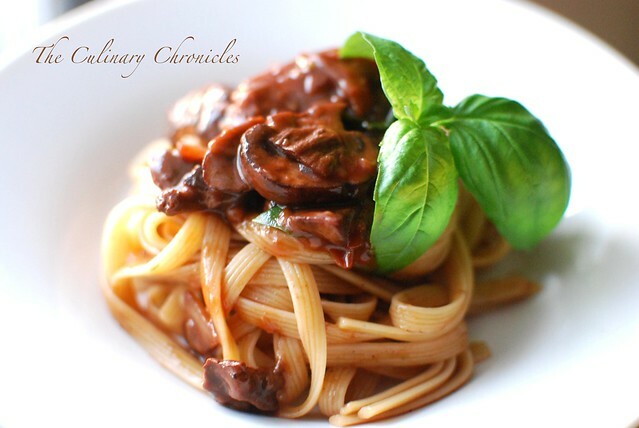 This little number is ALL about mushrooms and its earthy flavors. I used a mix of criminis, shitakes, oysters, and porcinis and then slowly cooked them down to create a rich ragoût. And holy SHITAKE—-it’s makes this mushroom-lovin’-gal HAPPY! Ah heck…….it’s freaking deliciously umami! In a bowl, add the dried porcini to the hot water. Allow to reconstitute for at least 20 minutes. In a large pan, heat olive oil over medium heat and sauté the shallots until translucent. Add garlic and red chili flakes and sauté for an addition 2 minutes. Add the sliced mushrooms and sauté until softened—about 10 minutes. Add the porcini mushrooms that were reconstituted in water, saving the liquid. Mix and sauté for an additional minute. Add in red wine and cook until the wine has nearly evaporated. Pour in the liquid that the porcini was reconstituted in––be careful not to add in the mushroom grit/sand. Cook until the liquid has reduced to half. In a small bowl, mash the butter and flour together with a fork. Add in the butter/flour mixture to the mushrooms, stirring it in well to combine and cook for 2 minutes. Add the stock and cook until the sauce is reduced and thickened to desired consistency. Add in basil and season with salt and pepper. Remove 1/3 of the mushrooms and toss in the hot fettucine noodles to the pan, tossing it in the ragoût evenly to coat the noodles. 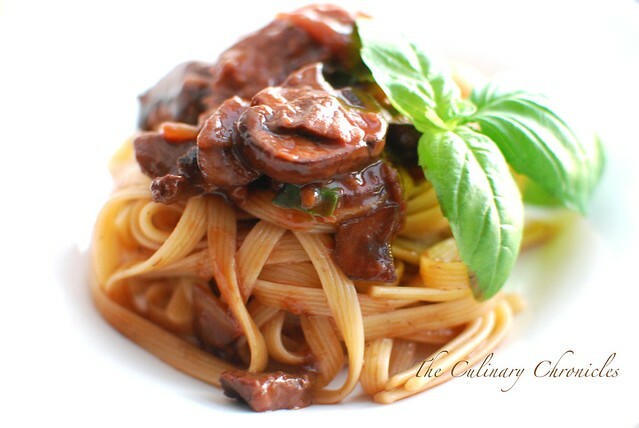 Plate the pasta and top with a spoonful of the remaining mushroom ragoût. I am freaking dying. This post was MADE for me. Mushrooms and I wear friendship bracelets. Pasta has given me its class ring. Your comment brought a huge smile on my face—it appears that we need to exchange friendship bracelets now! lol 🙂 Cheers and thanks for stopping by! Love the spice in there from red pepper flakes too. Good one. Sounds like winner winner mushroom dinner! If you are going to post more of these great recipes, I request a print button! What kind of pasta is that? The texture looks amazing! I’ve never seen fettuccine that looks like that before. I’ll look for it next time. Good find! What a lovely pasta dish! I love the chili flakes and all the mushrooms in it, and the way you presented it is just so beautiful! I am a huge mushroom fan too. This looks amazing with the red wine sauce and red pepper flakes! And your photography is beautiful as always! That is a tasty sounding mushroom pasta! This looks DELICIOUS! Seriously…it looks so meaty. I can’t believe it’s just mushrooms. I definitely have to make it for dinner soon!